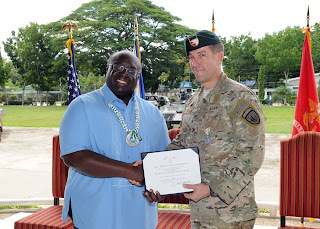 ZAMBOANGA CITY, Republic of the Philippines – Senior Philippine military and U.S. leaders recognized the exemplary service of a U.S. Army Special Forces commander who led U.S. efforts to support the Armed Forces of the Philippines’ fight against terrorism in the southern Philippines. 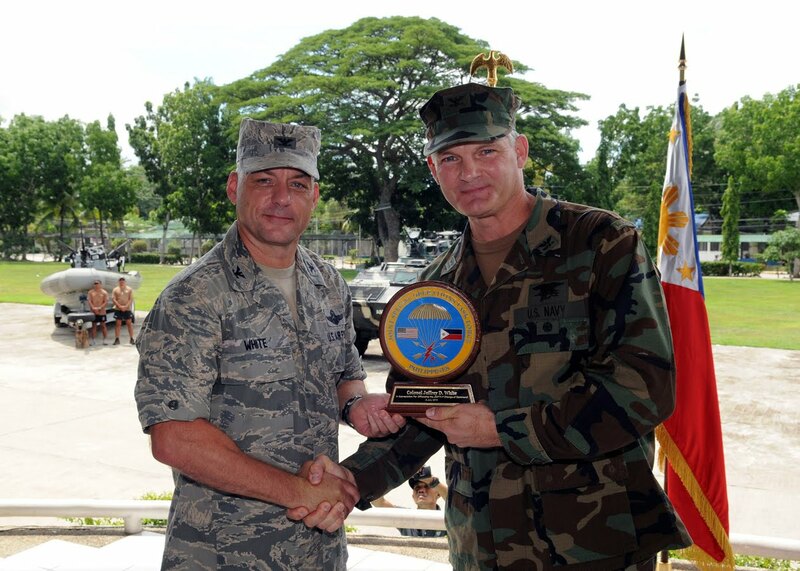 Col. William J. Coultrup, Commander, Joint Special Operations Task Force – Philippines (JSOTF-P) relinquished command to U.S. Navy Capt. 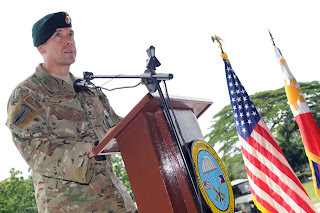 Robert V. Gusentine during a change-of-command ceremony held at Camp Navarro, Western Mindanao Command Headquarters July 2. “Bill, you are a true hero. It is an honor to be here recognizing your leadership, courage, vision and sheer tenacity,” said guest speaker, Ambassador to the Republic of the Philippines, Harry K. Thomas, Jr. praising the accomplishments of Coultrup. “You are an extraordinary leader who has developed JSOTF-P into an enabling force for peace, for improvement, and for progress in Mindanao,” said Thomas. Since arriving in the Philippines, Coultrup has overseen the completion of more than 151 developmental projects valued over $19 million. These projects were coordinated with the AFP and Government of the Republic of the Philippines to create the conditions necessary for socio-economic development, peace and prosperity in the Mindanao region. Improving the living conditions and livelihood of the people, helps separate them from the terrorist and lawless elements resulting in the steady erosion of popular support for the insurgents and increasing support for the Philippine government. Coultrup’s implementation of the “by, through, and with” method of foreign internal defense was key to building operational capacity in the AFP. By integrating all aspects of national power to include military, political, and economic means into a cohesive strategy for engagement, a significant and lasting improvement in the counter-terrorism and counter-insurgency capacity in the southern Philippines has been made. Col. Jose Johriel M. Cenabre, Chief of Staff, Western Mindanao Command has served and trained alongside JSOTF-P forces on the ground and at the headquarters level. He praised Coultrup for enhancing the enduring partnership to defeat common enemies in Mindanao. Coultrup’s leadership helped build AFP and PNP capacity through Subject Matter Expert Exchanges (SMEEs) that provided training in marksmanship skills, small unit tactics and explosive ordnance disposal, forward air control, maritime operations and casualty evacuation. Assistance has also been provided to the AFP in special operations planning and the sharing of information. The AFP has been successful in conducting targeted surgical strikes, designed to minimize collateral damage while neutralizing the threats, these efforts have led to the execution or capture of 56 known terrorists. Coultrup, whose next assignment is in Washington D.C., said this command has been one of his most rewarding. “My service here has been one the most rewarding times of my career in the military and in Special Operations. I have seen heartbreaking events and things that make me proud to be in the military doing this job,” said Coultrup. “And through it all, the men and women of the JSOTF-P have been there, side by side with their AFP counterparts working to bring a better life to the people of Mindanao. It has been my distinct pleasure to serve with you,” he ended. Gusentine, former Director for Operations at Special Operations Command Pacific in Hawaii, expressed his views on the relationship between the American and Filipino people. Ambassador Thomas extended his congratulations to Gusentine and told him the embassy offers their continued support to the AFP/U.S. partnership. “You inherit a thriving command and an excellent relationship with the AFP. You can count on us, and I know we can count on you,” concluded the Ambassador. At the request of the Philippine Government, JSOTF-P supports the comprehensive approach of the AFP in their fight against terrorism in the southern Philippines. JSOTF-P works alongside the AFP to create the conditions necessary for peace, stability and prosperity. At the request of the Philippine Government, JSOTF-P works together with the Armed Forces of the Philippines to fight terrorism and deliver humanitarian assistance to the people of Mindanao. U.S. forces are temporarily deployed to the Philippines in a strictly non-combat role to advise and assist the AFP, share information, and to conduct joint civil military operations. JSOTF-P is made up of Special Operations forces and support personnel from all four branches of the U.S. military. For more on the JSOTF-P mission, click here.